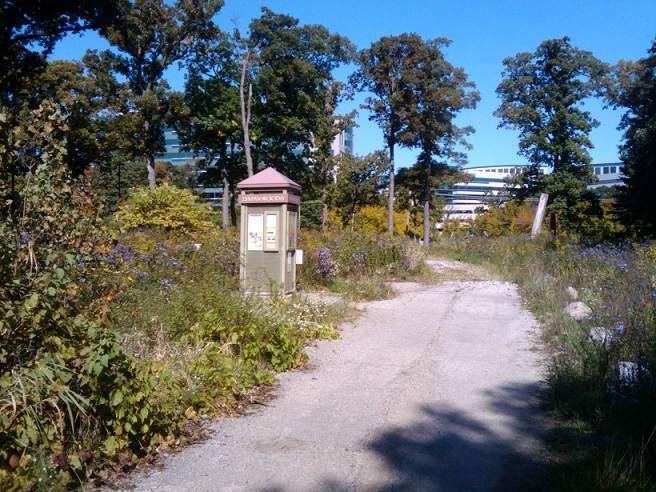 Lyman Woods occupies the southeast corner of Highland Avenue and 31st Street in Downers Grove. The preserve’s location seems a bit awkward and juxtaposed in contrast to the surrounding tall office buildings, but regardless, Lyman Woods should not be overlooked as a quite, natural respite. I assure you, once you are strolling down one of the woods’ natural, interior trails, the nearby office buildings and major thoroughfares are dwarfed by the scale and majesty of the massive aged oaks. The only indication that you are near the hustle-and-bustle of a small corporate metropolis is the sound of passing cars heard only when hiking the outer boundaries of the woods, and the occasional glimpse of office buildings through seasonally thinning tree cover. The entrance to Lyman Woods and parking is accessible on the south side of 31st Street, just east of the Highland Avenue intersection. Immediately south of the parking area is the William F. Sherman, Jr. Interpretive Center (the center is open Saturdays, June 1st – August 31st from 9AM to 4PM and 1PM to 4PM on Sundays). 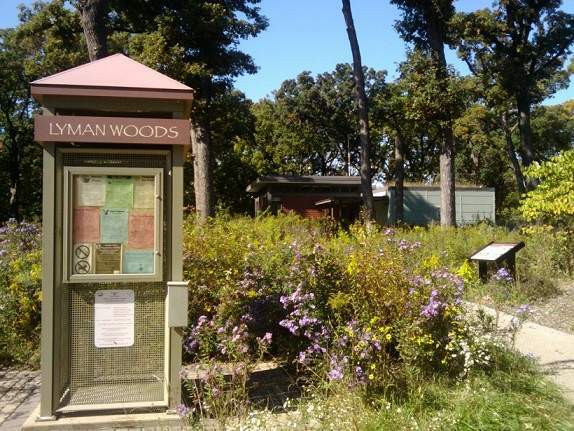 The center provides a look into the history and natural elements of Lyman Woods. The property has gone mostly unchanged since its purchase by the Lyman family in 1839. It occupies nearly 150 acres of land and is home to over 300 native species of plants and wildflowers. 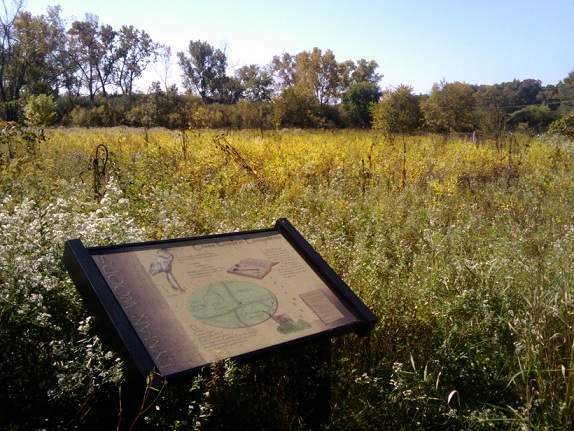 The preserve’s trails are a bit more rugged, narrow, and natural than some of the other DuPage County preserves (no crushed limestone or asphalt), but by no means difficult to traverse for the average hiker (Lyman Woods trail map). However, you will have to leave your dogs, bikes, and cross-country skis at home; they are not permitted in the preserve. The trails meander through the woods, crossing over a few small footbridges in areas where a narrow creek intersects the trail. Many segments of the trail are flanked by vibrant, colorful wildflowers (especially in late summer/early fall). Once you have started out on Lyman Woods’ main trail, the trail begins to branch out into smaller trails. You can continue south, head east, or follow a trail to the west. I prefer the trail to the west as it provides you with some excellent views of the interior woods. Taking the trail to the west, you will gradually shift to the south and then to the east, forming a large loop in the preserve. As the trail begins to turn to the east, you will come to a large prairie. Here, you will see a diverse sea of wildflowers and native prairie plants as you look south into the prairie. Listen closely for the subtle sounds of bubbling, running water. Just north of the trail in this area, is where the small creek you passed over earlier moves a bit more rapidly over some large rocks. 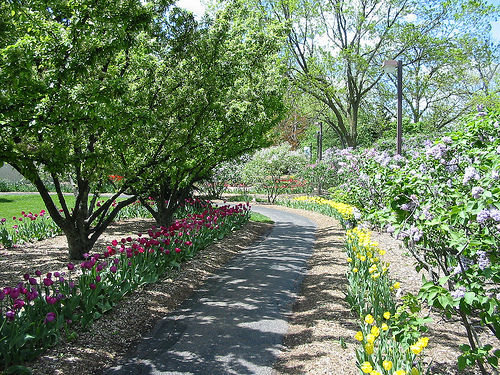 At the prairie, you have the option to turn right and head south on a trail that leads you alongside the prairie. Continuing on the original trail, which has now taken a slow turn to the east, you will head up a slight incline. At the top of this hill is what I would argue is one of the best views in all of DuPage County. From this vantage point, you have a great view into the woods to the northeast, and an beautiful view of a late through tall oak trees to the southeast. The photo below was taken from a cellular phone and absolutely does no justice in representing the true beauty of the view. There is a comfortable park bench here for you to relax and take in the scenery. You would never believe that you are less than 1000 feet from a bustling corporate complex. After a moment of two to relax, continue on the path heading downhill. The path will now lead you to a marsh area. Here you can see native water grasses, cattails, and bare dead trees that are offer a perch for many of the birds and red-tail hawks that make Lyman Woods their home. At this point, you can chose to continue on to the right along a trail that loops through the eastern-most boundaries of the forest preserve. The trail to the left will lead you back towards the main trailhead, visitor’s center, and parking lot. A hiker could easily traverse the entire course I’ve described in this post within the period of half an hour. 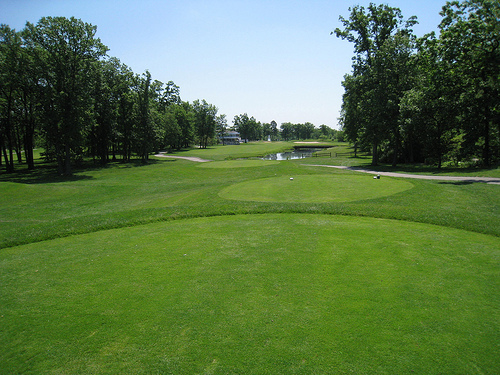 However, I suggest you allow yourself an hour to follow this course, doing so will allow a bit more time to take in much of the beauty that Lyman Woods offers. 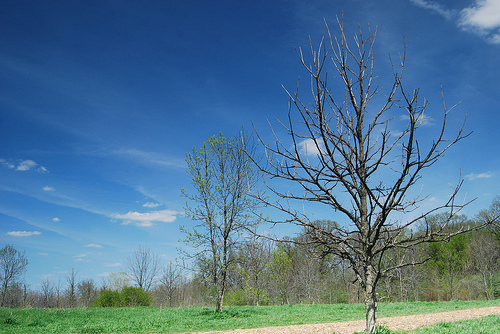 I’m amazed at the preserve’s environmental diversity. 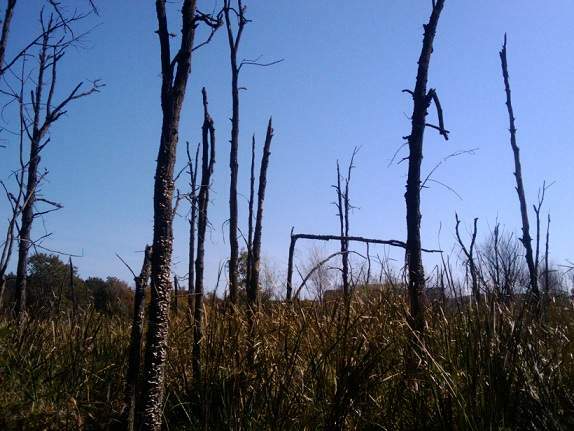 Inside of one mile, you will see woods, a prairie, a lake, and a marsh area. 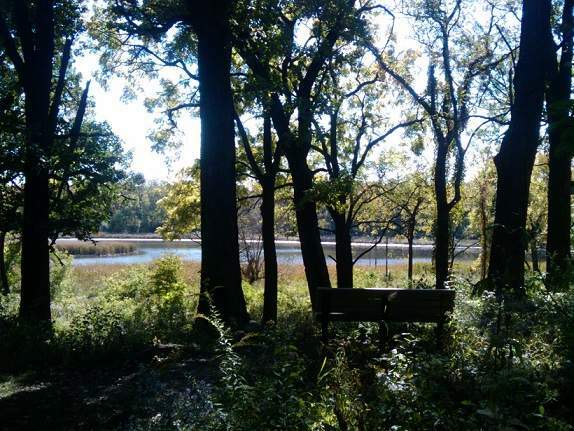 Few of DuPage County’s other forest preserves offers such a diverse landscape in such a compact area. Another aspect of Lyman Woods that I really like is that there are numerous places to stop, rest, and sit down. There are many strategically-placed benches and signs describing the area’s landscape and wildlife. Don’t be surprised if you see a lot of wildlife on your hike. There are numerous hawk, deer, fox, squirrel, and rabbit that scurry busily about. Watch your step too… On my last visit I nearly stepped on a leaf bug and a garter snake that were resting right on the trail. I have yet to have seen a deer or a fox, but many visitors have seen them here. 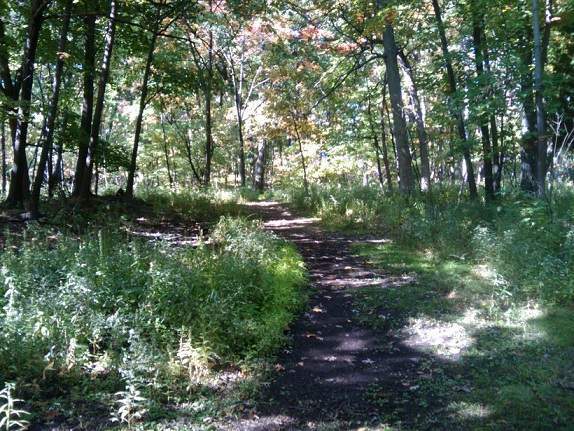 Get outside and explore one of DuPage County’s finest forest preserves, Lyman Woods.